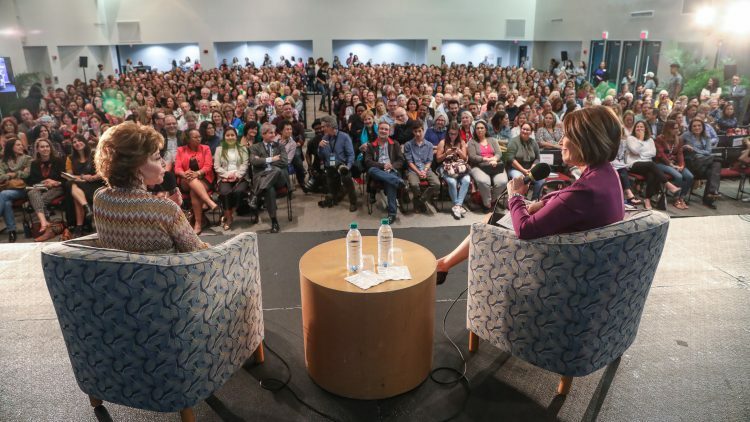 The Miami Book Fair, (Nov. 11 – 18), has consistently connected South Florida to the cream of the literary crop. This year is no different. Evenings With and Special Event headliners include Liane Moriarty, April Ryan, Pete Souza, Tina Brown, as well as 2018 National Book Award winners and nominees, among others. Presentations will take place at the Wolfson Campus, Chapman Conference Center in downtown Miami, starting on Sunday, Nov. 11 and ending on Friday, Nov. 16. Evenings With and Special Event programs require a ticket. Tickets will be available to the general public at 10 a.m., Oct. 29 (and to Friends of the Fair at 10 a.m., Oct. 17) at miamibookfair.com. To become a Friend of the Fair, and receive this and other benefits of membership, go to miamibookfair.com and click on Become a Friend or call 305-460-6575. Once again, Miami Book Fair is pleased to have WLRN as the Presenting Media Sponsor of the Evenings With program. Brown is an award-winning writer and editor, and founder of the Women in the World Summit. Between 1979 and 2001 she was the editor of Tatler, Vanity Fair, and The New Yorker. Her 2007 biography of the Princess of Wales, The Diana Chronicles, topped the New York Times bestseller list. In 2008 she founded the award-winning news site, The Daily Beast. The Vanity Fair Diaries: Power, Wealth, Celebrity, and Dreams: My Years at the Magazine That Defined a Decade (Picador) is the story of an Englishwoman barely out of her twenties who is summoned to New York in hopes that she can save Condé Nast’s troubled new flagship, Vanity Fair. Brown is plunged into the maelstrom of the competitive New York media world and the backstabbing rivalries at the court of the planet’s slickest, most glamour-focused magazine company. Astute, open-hearted, often riotously funny, Brown’s The Vanity Fair Diaries is a compulsively fascinating and intimate chronicle of a woman’s life in a glittering era. Moriarty is the author of six internationally best-selling novels, Three Wishes, The Last Anniversary, What Alice Forgot, The Hypnotist’s Love Story and the #1 New York Times bestsellers The Husband’s Secret and Big Little Lies, which was adapted into an award-winning series on HBO. In Moriarty’s latest, Nine Perfect Strangers (Flatiron Books), nine people gather at a remote health resort. Some are there to lose weight, some to get a reboot on life, some for reasons they can’t even admit to themselves. Amidst the luxury and pampering, the mindfulness and meditation, all nine characters know their stay might involve some real work. But none of them can imagine just how challenging the next ten days are going to be. Monday, Nov. 12, 6 p.m. / Chapman (Bldg. 3, 2nd Floor) Tickets $35 (includes copy of Alternate Side). Quindlen is a novelist and journalist whose work has appeared on fiction, nonfiction, and self-help bestseller lists. She is the author of nine novels, including the #1 New York Times bestseller Plenty of Cake. Her A Short Guide to a Happy Life has sold more than a million copies. While a columnist at The New York Times, she won the Pulitzer Prize and published two collections, Living Out Loud and Thinking Out Loud. Quindlen’s latest novel, Alternate Side (Random House), exposes the fault lines in a seemingly perfect Manhattan neighborhood. When violence leaves the area shaken, the enviable dead-end block turns into a potent symbol of a divided city. USA Today writes, “[Alternate Side] captures the angst and anxiety of modern life with . . . astute observations about interactions between the haves and have-nots, and the realities of life among the long-married. One of today’s leading African writers and scholars, Kenyan-born Thiong’o’s Wrestling with the Devil: A Prison Memoir (The New Press) is the unforgettable chronicle of the year this brilliant novelist and memoirist, long favored for the Nobel Prize, was thrown in a Kenyan jail without charge. There, he lives in a prison block with eighteen other political prisoners, quarantined from the general prison population. He captures not only the excruciating pain that comes from being cut off from his wife and children, but also the spirit of defiance that defines hope. Ultimately, Wrestling with the Devil is a testimony to the power of imagination to help humans break free of confinement, which is truly the story of all art. New York Times best-selling author, Jones is the author of the novels Leaving Atlanta, The Untelling, and Silver Sparrow, which was added to the NEA Big Read Library of classics in 2016. A member of the Fellowship of Southern Writers, her honors include the Hurston/Wright Legacy Award and a Lifetime Achievement Award in Fine Arts from the Congressional Black Caucus Foundation. In her latest novel, An American Marriage (Algonquin Books), newlyweds Celestial and Roy are the embodiment of both the American Dream and the New South. But as they settle into the routine of their life together, they are ripped apart by circumstances neither could have imagined. An American Marriage is a masterpiece of storytelling, an intimate look deep into the souls of people who must reckon with the past while moving forward—with hope and pain—into the future. Jones has been nominated for a 2018 National Book Award. Souza was the Chief Official White House Photographer for President Obama and the Director of the White House Photo Office. Previously Souza was an Assistant Professor of Photojournalism at Ohio University, the national photographer for the Chicago Tribune, a freelancer for National Geographic, and an Official White House Photographer for President Reagan. His books include the New York Times bestsellers Obama: An Intimate Portrait and The Rise of Barack Obama. His most recent book, Shade: A Tale of Two Presidents (Little, Brown and Company), is a portrait in Presidential contrasts, telling the tale of the Obama and Trump administrations through a series of visual juxtapositions. Here, more than one hundred of Souza’s unforgettable images of President Obama deliver new power and meaning when framed by the tweets, news headlines, and quotes that defined the first 500 days of the Trump White House. Wright is a staff writer for The New Yorker, a playwright and screenwriter. He is the author of nine previous books of nonfiction—including Remembering Satan, Going Clear and The Terror Years—and one novel, God’s Favorite. His books have received many prizes and honors, including a Pulitzer Prize for The Looming Tower. In God Save Texas: A Journey into the Soul of the Lone Star State (Knopf), Wright explores the history, culture, and politics of Texas, while holding the stereotypes up for rigorous scrutiny. Wright’s profound portrait of the state not only reflects our country as it is, but as it was, and as it might be. Goodwin’s interest in leadership began more than half a century ago, when LBJ asked her to help him write his memoirs. That project would propel Goodwin into a decades-long career as a presidential biographer. Her books include Lyndon Johnson and the American Dream, the Pulitzer Prize-winning No Ordinary Time; Franklin & Eleanor Roosevelt: The Home Front in World War II, and the runaway bestseller Team of Rivals, which was adapted into the Academy Award-winning film Lincoln. In her latest book, Leadership in Turbulent Times (Simon & Schuster), Goodwin draws upon the four presidents she has studied most closely—Abraham Lincoln, Theodore Roosevelt, Franklin D. Roosevelt, and Lyndon B. Johnson—to show how they recognized leadership qualities within themselves and were recognized as leaders by others. Ryan has been a White House correspondent since 1997 and is the Washington, D.C. Bureau Chief for the American Urban Radio Networks. In addition, she can be seen almost daily as a political analyst for CNN. She has been featured in Vogue, Cosmopolitan, and Elle magazines as well as the New York Times, Washington Post, and Politico, to name a few, and has appeared on The Late Show with Stephen Colbert, Anderson Cooper 360, Hardball, Meet the Press, and many other television news programs. She is the 2017 National Association of Black Journalists Journalist of the Year. White House reporter April Ryan thought she had seen everything in her two decades as a White House correspondent. And then came the Trump administration. In Under Fire: Reporting from the Front Lines of the Trump White House (Rowman & Littlefield Publishers) Ryan takes us inside the confusion and chaos of the Trump White House to understand how she and other reporters adjusted to the new normal. She takes us inside the policy debates, the revolving door of personnel appointments, and what it is like when she, as a reporter asking difficult questions, finds herself in the spotlight, becoming part of the story. Miami Book Fair, in partnership with the National Book Foundation and with the generous support of the John S. and James L. Knight Foundation, welcomes the Finalists and Winners of the prestigious National Book Foundation’s National Book Awards. Previous winners of the Award—including William Carlos Williams, Joyce Carol Oates, and William Faulkner—comprise a who’s who of American literature. Following the awards ceremony in New York City on November 14, at which the winners will be announced, finalists and winners in the categories of fiction, nonfiction, poetry, and young people’s literature will travel to Miami for this remarkable gathering of literary talent. Sponsored by the Knight Foundation.